Dzhokhar Tsarnaev was convicted on all charges in the Boston Marathon bombing by a federal jury that now must decide whether the 21-year-old former college student should be executed. Dzhokhar Tsarnaev was convicted on all charges Wednesday in the Boston Marathon bombing by a federal jury that now must decide whether the 21-year-old former college student should be executed. Tsarnaev folded his arms, fidgeted and looked down at the defence table as he listened to one guilty verdict after another on all 30 counts against him, including conspiracy and deadly use of a weapon of mass destruction. Seventeen of those counts are punishable by death. The jury took a day and a half to reach its verdict, which was practically a foregone conclusion, given his lawyer's startling admission during opening statements that Tsarnaev carried out the attack with his now dead older brother, Tamerlan. Two shrapnel-packed pressure-cooker bombs that exploded near the finish line on April 15, 2013, killed three spectators and wounded more than 260 other people, turning the traditionally celebratory home stretch of the world-famous race into a scene of carnage and putting the city on edge for days. In the next phase of the trial, which could begin as early as Monday, the jury will hear evidence on whether Tsarnaev should get the death penalty or spend the rest of his life in prison. In a bid to save Tsarnaev from a death sentence, lawyer Judy Clarke has argued that Tsarnaev, then 19, fell under the influence of his radicalized brother. Tamerlan, 26, died when he was shot by police and run over by his brother during a chaotic getaway attempt days after the bombing. Prosecutors, however, portrayed the brothers — ethnic Chechens who moved to the U.S. from Russia more than a decade ago — as full partners in a plan to punish the U.S. for its wars in Muslim countries. Jihadist writings, lectures and videos were found on both their computers, though the defence argued that Tamerlan downloaded the material and sent it to his brother. The government called 92 witnesses over 15 days, painting a hellish scene of torn-off limbs, blood-spattered pavement, ghastly screams and the smell of sulphur and burned hair. Survivors gave heartbreaking testimony about losing legs in the blasts or watching people die. The father of an eight-year-old boy described making the agonizing decision to leave his mortally wounded son so he could get help for their six-year-old daughter, whose leg had been blown off. Killed were Lingzi Lu, a 23-year-old Chinese graduate student at Boston University; Krystle Campbell, a 29-year-old restaurant manager; and Martin Richard, the eight-year-old. Massachusetts Institute of Technology police officer Sean Collier was shot and killed during the brothers' getaway attempt. Some of the most damning evidence included video showing Tsarnaev planting a backpack containing one of the bombs near where the eight-year-old was standing, and incriminating statements scrawled inside the dry-docked boat where a wounded and bleeding Tsarnaev was captured days after the tragedy. Witnesses testified about phone records that showed Dzhokhar was at the University of Massachusetts-Dartmouth while his brother was buying bomb components, including pressure cookers and BBs. A forensics expert said Tamerlan's computer showed search terms such as "detonator," "transmitter and receiver," while Dzhokhar was largely spending time on Facebook and other social media sites. Also, an FBI investigator said Tamerlan's fingerprints — but not Dzhokhar's — were found on pieces of the two bombs. Clarke is one of America's foremost death penalty specialists and has kept other high-profile defendants off death row. She saved the lives of Unabomber Ted Kaczynski and Susan Smith, the South Carolina woman who drowned her two children in a lake in 1994. During the penalty phase, Tsarnaev's lawyers will present so-called mitigating evidence they hope will save his life. That could include evidence about his family, his relationship with his brother, and his childhood in the former Soviet republic of Kyrgyzstan and later in the volatile Dagestan region of Russia. Prosecutors will present so-called aggravating factors in support of the death penalty, including the killing of a child and the targeting of the marathon because of the potential for maximum bloodshed. Not all survivors, however, found closure in the verdict. "It's not something you'll ever be over. You'll feel it forever," Karen Brassard told reporters after the verdict. She was injured during the bombings along with her husband and daughter. 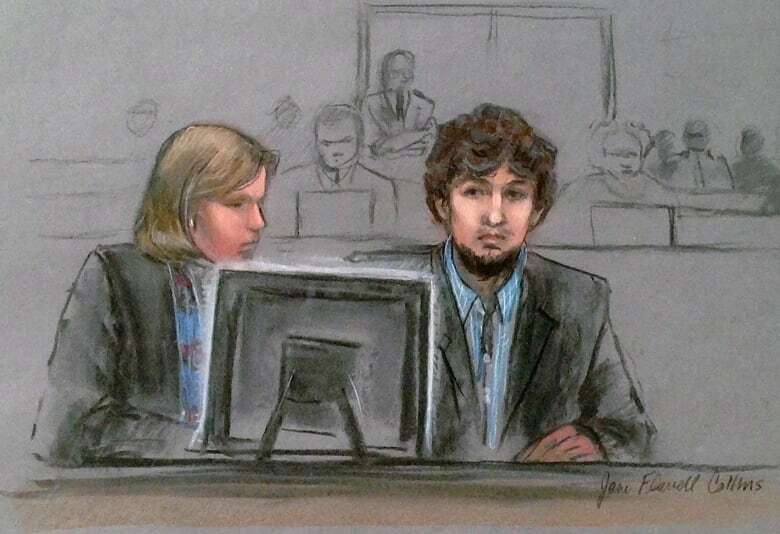 Brassard described Tsarnaev as "arrogant" and "disinterested" throughout the trial. She said she believes the guilty verdict was a foregone conclusion. "There was far too much evidence showing that that's what happened, so [the jury] had no other option."